At the beginning of Friends and Traitors we go back to 1935. Frederick Troy is a young man, starting out on his police career as a uniformed bobby. He meets Guy Burgess for the first time at a family dinner party. Alcoholic, openly gay (a criminal offence at this time), and of course he is headed toward notoriety as a Soviet spy and a defector. We are introduced to the Troy family. Troy senior is a Russia émigré, now a successful newspaper baron. Freddie's brother Rod and twin sisters Sasha and Masha are an amoral pair of good time girls. Troy and Burgess become acquainted but never become close friends. The first half of the novel is a series of their occasional meetings over some 20 years. Burgess has defected but he meets up with Troy in Vienna. Troy is now a senior police officer. His brother Rod is an MP destined for high office. Contacts with spies have consequences for both brothers; cue the next part of the story where espionage and politics join the mix. Friends and Traitors is an exceptional novel interesting and ingenious. Lawton has a shrewd understanding of the period he writes about and the research is meticulous. As always he evokes atmosphere beautifully. The characters are well rounded and believable, the plot is skilled with of course, a few twists and turns. The Troy series is written out of sequence from the 1930s into the 1950s/60s and back again. Familiar characters appear throughout the series, many resurface in Friends and Traitors, although this is a stand-alone book; fans get the chance to find out more about the characters and in some ways it ties-up previous story lines. Troy appears in the new Holdeness novels while Joe appears in this one. 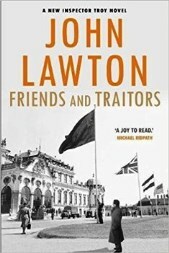 The stylishness of the writing make John Lawton’s books seductive and always a brilliant read. I highly recommend it.